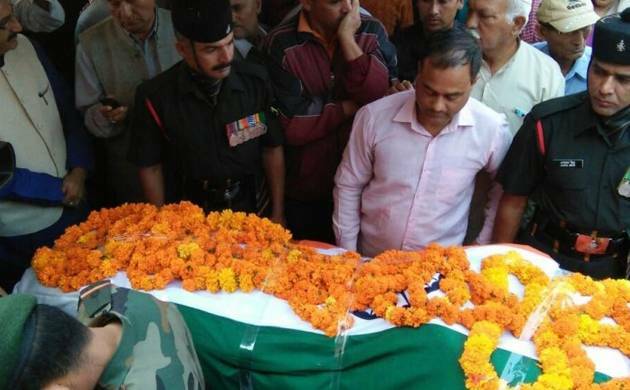 The mortal remains of rifleman Sandeep Singh Rawat, who died while foiling an infiltration bid along the LoC in Jammu and Kashmir's Tangdhar sector, were consigned to flames on Saturday with full state honours in Haridwar. A host of dignitaries led by Chief Minister Harish Rawat paid tribute to the martyr as his body was flown in here this morning. "I salute the martyrdom of a brave father's brave son. Not a day passes these days when a mother does not lose her son for the sake of the nation. All these sacrifices are meant for the nation," Rawat said after laying a wreath on Sandeep's body. Sandeep's father Harendra Singh Rawat is also an ex-servicemen. Sandeep had joined the sixth Garhwal Rifles of the Army only in January last year. The Chief Minister said the entire country and the state stood by the family of the martyr in this hour of grief. "I feel it is time to wage a decisive war against terrorism and Pakistan," Rawat said. Former chief minister Ramesh Pokhriyal Nishank, state BJP president Ajay Bhatt and the party's Mahanagar president Umesh Aggarwal also paid tribute to the martyr. A huge crowd came out in the streets as the coffin wrapped in the national flag carrying Sandeep's body was being taken to his Navada residence in the city. The mortal remains of the martyr were then taken to Haridwar for the last rites and consigned to flames after a guard of honour by the police at Kharkhari cremation ground. Sandeep had sustained bullet injuries on Thursday while foiling an infiltration bid by terrorists near the LoC in Tangdhar.